Hydroptere can reach speeds of 60mph using its giant 'wings' to lift most of its frame above the water. Mast is 28m high - almost as tall as the Christ the Redeemer statue in Rio de Janeiro, Brazil. It can reach 50mph in ten seconds and has broken world records with its aeronautic design. KCBS In Depth: Oracle Team USA Oozing Confidence Ahead Of America’s Cup « CBS San Francisco: "The skipper of Oracle Team USA and his sailing team appear to be brimming with confidence as they look forward to sailing on home waters before an enthusiastic home crowd at the 34th America’s Cup match, beginning Sept. 7 on San Francisco Bay. Most recently, defending America’s Cup champion Oracle Team USA christened and launched its new 72-foot, wing-sailed catamaran. But, because of strong winds, the syndicate canceled the fast cat’s maiden voyage, reasoning there was still plenty of time to do so before the competition." Oman Sail, a government organisation launched in 2008 to develop the sport in the sultanate, has its headquarters in the new marina adjoining this development. The venture is headed by Briton David Graham, assisted by 190 employees, mainly Omanis. The Harvard sailing team split up along the Charles River, as the Crimson competed in three regattas in the Boston area. Harvard picked up a sixth place finish at the 45th Women's President's Trophy Intersectional, hosted by neighboring Boston University. British man rescued from yacht after skipper lost overboard | World news | guardian.co.uk: ". . . Officials from the Marine Rescue Co-ordination Centre based at Falmouth in Britain reported to the US Coast Guard at 11.30pm on Saturday that one man from the 38ft (12-metre) vessel had fallen overboard and the person who remained on board had little sailing experience. . . . Two navy helicopters were sent to search from the Peleliu at about 5am on Sunday. One of them found the boat and the man on board, lowered a hoist and pulled him in. . . . Chandler said that while remote, the location of the boat was not especially surprising. "People sail pretty often pretty far out of reach," he said. "I don't think that it's that unusual."" It's day 1 of racing at Antigua Sailing Week 2013 (27 April - 3 May) and today we get the inside scoop from the crew from Voilactus and how winning The Hamptons Challenge brought them to Antigua to take part in the Caribbean's premier sailing event. Cape Cod Academy is headed to the National Fleet Racing sailing championships for the second straight year. The Seahawk sailors won the New England championship Sunday at Indian Harbor Yacht Club, edging out North Kingstown, R.I., on a tiebreaker. America's Cup World Series Naples - AC Discovered (video) - This week America's Cup Discovered brings you match racing from the final 2012/2013 America's Cup World Series in Naples, Italy. We take you through both semi-finals and the winner takes all grand finale. Annapolis sailing community remembers Don Backe, founder of CRAB - baltimoresun.com: "Don Backe never won the America's Cup or any other world-class sailing event, but he probably had more of an impact on the sport around the Chesapeake Bay than any champion. A segment of the local sailing community — the physically and emotionally disabled as well as those who couldn't afford to sail — are deeply indebted to Backe, who helped found Chesapeake Region Accessible Boating (CRAB) in 1991, four years after a car accident left him a paraplegic. While mourning his death on April 12 at age 77 after a prolonged illness, those who knew Backe are also celebrating his life — particularly the last 22 years of it. A memorial service is being planned for June in Annapolis, where Backe's nonprofit was based. . . ."
Mullan wins two-day sailing event. Topper National Junior Squad member Joseph Mullan, 15, won National Series 1, a two-day sailing competition held at Datchet Water Sailing Club from April 13-14. Kiwis Alex Maloney and Molly Meech have won gold at ISAF Sailing World Cup Hyeres in the 49erFX class, securing victory after six days of racing off the French coast. "We're definitely happy that we won our first World Cup event in Europe," says Maloney. Extreme Sailing Series -Act 3: Qingdao, China, May 2-5 - China's Olympic Sailing City Qingdao is preparing to welcome the eight international Extreme 40 teams for Act 3 of their international non-stop tour of the globe. Only two weeks ago the Swiss team Alinghi claimed victory in Singapore before the fleet and all the Series paraphernalia were packed into containers and shipped by Logistics Partner GAC Pindar non-stop to Qingdao. J/Boats News is a digest of worldwide events, regattas, and news forsailing enthusiasts and members of our J Community. 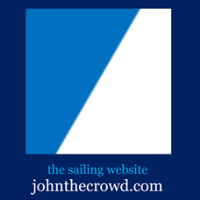 Contributions regarding your racing, cruising or human interest stories on-board J's are welcome- please send to "editor@jboats.com". Royal Navy officer's yacht collided with oil tanker after straying into shipping lane - Telegraph: "Roland Wilson, a former Royal Navy lieutenant, was accused of negligence yesterday. Mr Wilson and his seven-man crew were on the penultimate leg of the race on the first day of the regatta, when their yacht crashed into the side of the 120,000 ton Hanne Knutsen. It is thought that several serving commanders and chief petty officers were manning the Royal Naval Sailing Association’s 33ft Atalanta of Chester. Thousands of spectators watched from the shore as the mast was ripped off after becoming tangled in the tanker’s anchor, a court was told." Hear from the ORACLE TEAM USA crew what it's like to fly their AC72 "17" on foils, sometimes at speeds of over 40 knots, and experience the sensational acceleration from on-board. Oracle christens America's Cup catamaran - San Jose Mercury News: " . . . This America's Cup could be won or lost depending on teams' ability to foil, which is when the boat develops enough lift that both hulls are out of the water and the seven-ton cat is skimming along the waves on foils on the rudders and on a daggerboard on the leeward hull. Foiling reduces drag and, as a result, increases speed. "What's so amazing about this boat is it's suspended on these tiny pieces of engineered carbon fiber," Spithill said. "That's why these boats are so cutting edge technologically, and we're pushing them right to the limit. . . . "Once the boat foils, it's like hitting a turbo button in a car and off she goes," Spithill said. . . ."
Ben Ainslie's ambition: Sailing hero takes on America's Cup challenge - CNN.com: " . . . while the sport has an elitist image, Ainslie says that anyone can enjoy sailing. "People think it's either a very expensive sport or it's just far too complicated -- and really it's neither," said the Englishman, whose family moved to Cornwall on the south-west coast of the UK when he was young. "At the grassroots level you can go down to a sailing club and you can just get into a dinghy and borrow a boat or start sailing and crewing for someone else and get into it for very little money." Ainslie's Olympic days came to a glorious golden end at London 2012, as he overcame what he thought were dubious race tactics to beat his rivals and claim the Finn Class title in the final race. . . ."
Sailing | Solid day at World Cup regatta for Kiwi... | Stuff.co.nz: "Four New Zealand crews remain in the top-five but the men's 470 pair of Paul Snow-Hansen and Dan Willcox have dived down the leaderboard at the halfway point in the World Cup sailing regatta in France. In good breeze off Hyeres, Alex Maloney and Molly Meech (second in 49er FX), Sam Meech (fourth in Laser, and Josh Junior (fourth in Finn) retained spots in the top five in their respective fleets, while Thomas Saunders (fifth in Laser) joined them." Sailing World Cup 2013 - Hyeres: "Two days of fickle breeze at ISAF Sailing World Cup Hyères brought the Qualification Series to a close as the world's best sailors positioned themselves at the top ahead of three days of Final Series racing. In a breeze that stabilised later on in the day, peaking at 10 knots, Ivan Pastor (ESP) and Charline Picon (FRA) were the star performers in the Men's and Women's RS:X on the second day of racing in Hyères to take a clean score through to the Final Series." Commodore of West Kirby Sailing Club, David Taylor, said: “The Wilson trophy is renowned for its very special atmosphere; and this is a fantastic opportunity to come and watch some of the world's finest sailors in action and to cheer on our Olympic heroes. Sailing to Seaside: Was that Snooki we saw? ... who proved once again to be up to our expectations.” Luna Rossa Swordfish and Luna Rossa Piranha are both gearing up for the Louis Vuitton Cup-Challenger Selection Series and the 34th America's Cup events taking place in San Francisco in July. Luna Rossa, ORACLE TEAM USA winners at America’s Cup World Series Naples / America’s Cup: "Led by helmsman Francesco Bruni, Luna Rossa Swordfish . . . won the overall championship of the America’s Cup World Series Naples. . . . Slingsby delivered on his stated goal: to secure the overall 2012-2013 America’s Cup World Series season championship for ORACLE TEAM USA, the defense team in the upcoming 34th America’s Cup (Sept. 7-21). He wrapped up that championship yesterday and today added the match racing title as well. “I’m really proud to be getting the America’s Cup World Series trophy for ORACLE TEAM USA,” said Slingsby. ORACLE TEAM USA also won last year’s championship. “Jimmy Spithill and his team set it up for us. We just had to come here, do our best and luckily he gave us enough of a lead to take home the trophy.”. . ."
The event was hotly contested by eight teams comprising 40 sailors and saw some big guns such as Arjuna Awardee Mahesh and Mongia mixing it up with fresh new challengers like Gulshan Chunekar, R Mutthu and the defending champion, Ayaz Shaikh. J/22 Sailing Caymans- A Cracking Good Time Racing! Slingsby ready to deliver America’s Cup World Series championship for ORACLE TEAM USA / America’s Cup: " . . . Slingsby has shown a steady hand in his first America’s Cup World Series regatta, leading the team into tomorrow’s match racing championship and also eyeing a chance to win the fleet racing championship. But regardless of how he finishes tomorrow, ORACLE TEAM USA is in a strong position for the overall season championship (barring an unforeseen circumstance). “It’s great for the team, winning the America’s Cup World Series for the second year in a row,” said Slingsby. “I’m glad I could help in some way, but this championship doesn’t belong to me. It belongs to Jimmy and his team for setting it all up. I came in with a nice big lead.”. . ."
Charleston Raceweek 2013 | April 18-21, 2013: "Overcast skies with fresh southerly winds punching the anemometer into the high teens, that’s how Friday started for racers at Sperry Top-Sider Charleston Race Week. The forecast called for the winds to surge throughout the day due to an impending frontal system, and the weather meister was spot on. With winds averaging 20 knots – and often surging to 26 and above – Day 1 at Sperry Top-Sider Charleston Race Week . . . "
Michael and Eve Bonham Cozens invited people who had worked andsailed on Gemervescene of London to Lake Yard in Hamworthy see the boat “dressed overall” – in other words decked with flags – and raise a glass to mark the completion of the project.